Personally, my favorite time in the history of the toothpick is the late Victorian era when they were accepted as a table item and appeared on every well-set table. Its not that I love toothpicks, really, but I do love the little containers that held them during those Victorian days of opulence. Toothpick holders, that’s my passion! They were made of glass, china, metal, and other materials. They sometimes matched the dinnerware and other times were of a unique design that stood alone and stood out. They were passed around the table at the end of the meal and it was considered entirely appropriate to pick one’s teeth at the table. Grant you, those with the best of manners often held a linen napkin in front of their mouth with one hand while they cleaned their teeth with the other. Here, in North America, toothpick holders (or toothpicks, as they are commonly called by collectors) came into being in the mid 1880s and remained in vogue until about 1920. During that time, they were readily available and nearly every household had at least one. Collecting “toothpicks” became my hobby when I was a child and was given several by my Great Aunt Bertha. Most of them had been ‘give away’ items commemorating some special event. For example, the ruby stained Punty Band that she gave me bore the inscription “Robinson Park, Fort Wayne, Ind.” She had received it as a souvenir on the opening day of Robinson Park. What started as a little girl with a small collection has now grown into an active collecting passion. I have over 1200 toothpicks and I am always looking to add to my collection. My collection includes a wide variety of toothpicks. I have art glass, pressed glass, cut glass, china, figurals, and metal. And all have special significance to me. Some, because of they were a gift from a special friend or relative, others because of their rarity or their charm, and still others because I found them at a bargain price! For those who are less compulsive about collecting than I, collecting toothpicks makes a great hobby because it is easy to specialize in one style or category. For example, you might choose to collect only art glass and look for examples in Burmese, Pomona, Amberina, and Peach Blow. Or perhaps you like cut glass. There are some really great cut glass toothpicks. If you prefer a category where there are many, many different toothpicks available, you could collect pressed glass. There are literally hundreds of patterns! Within the pressed glass category, you could limit your collection by collecting only ruby stained items. Or opalescent items. Or clear glass. Or focus on a particular color – cobalt blue, green, amber. 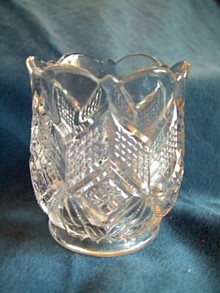 Or collect those made by a specific company such as Fostoria, Northwood, or Heisey. There are many options! Figurals are a rather unique category of toothpicks. These are the ones that are in the shape of some item. Some of the shapes you would find are corsets and drawers (remember these came from the Victorian era! ), frogs, books, fish, dogs, cannons – well, you get the idea. The list is endless. Metal toothpicks are primarily silver plated wares, but you will find them also in sterling and other metals. Within the metal category, some are figurals, some have feet and/or handles, and some are souvenirs of places, events, or buildings. China toothpicks are interesting in that, unlike the glass toothpicks, most of them were made in Europe and Asia. Very few were made in the United States or Canada. Some were made overseas and imported as blanks to be decorated by large decorating firms such as Pickard, or by ladies who painted as a hobby. As with the glass toothpicks, there is an infinite variety available. China toothpicks tend to be known more for the region they came from than by individual manufacturers. Some of the better known would be R. S. Prussia, R. S. Germany, Nippon (Japan), Bavaria, and Royal Bayreuth (which also identifies the manufacturer). Many of them are hand painted and quite a few have two or three handles. Cost is always a consideration when collecting and, of course, the actual value of the items is of equal interest. Let’s talk first about cost. As you would assume, the art glass are the rarest and most expensive category to collect. This has a direct correlation with the manufacturing process. 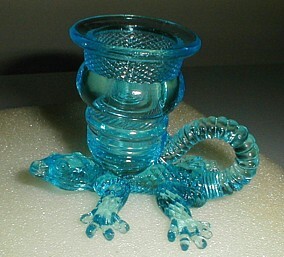 They were not mass produced as most pressed glass items were, and the manufacturing process often required extra steps to create the desired colors and effects. 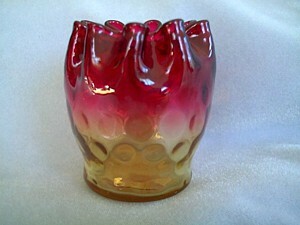 Many forms of art glass involved a reheating process that altered the color of the glass. They are sometimes referred to as “heat sensitive” glass. 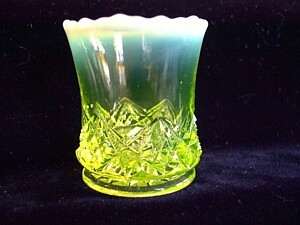 Burmese and amberina are prime examples of this type of glass. Burmese is an opaque glass that typically has a creamy shade of yellow on the lower portion of the item that gradually changes to a delicate pink at the top. The color comes from the gold and uranium that were part of the glass formula. 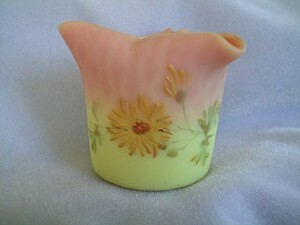 When the item is first created (most are blown or blown into a mold), it is a creamy yellow. Exposing the item to the high temperatures of the furnace after it has been shaped (it is inserted into the ‘glory hole’ for a short period of time), causes the pink color to emerge. The amount of pink coloration and the depth of the color are related to the degree of heat to which the item is exposed. Similarly, amberina includes gold in the batch and is initially a golden amber color. The reheating causes the top portion of the item to turn red. Still other forms of art glass may be made of two thin layers of glass. The layers may be different colors, or a pattern might be created by trapping air between the two layers. It is difficult to be specific when talking about the value of art glass toothpick holders because it varies considerably, but it is safe to say that most would sell at the higher end of all toothpicks, especially the rare ones. If that is a little beyond what you have budgeted for your hobby, do not despair. You are among the majority of collectors! Art glass is the ‘top of the line’, but there are many other beautiful and interesting options. Consider, for example, the pressed glass toothpicks. There are so many patterns it would be nearly impossible to locate and purchase an example of each. Prices vary, but they are generally considerably less than art glass. The toothpicks are beautifully designed and are often decorated with etching, hand painted designs, the application of colored stains, varying the thickness of the glass (an optic effect), or opalescence (another heat-sensitive process that results in a white, opal-like to rim). I often recommend china toothpick holders to new collectors. They are fairly easy to find and, since little has been documented as to manufacturer and pattern names, they have not attracted as much attention from collectors. As a result of this, prices have not escalated as rapidly as they have for glass and metal toothpicks and are fairly reasonable. That is amazing when you consider that many of them are hand painted and they are about 100 years old. Some of the art work is fantastic! 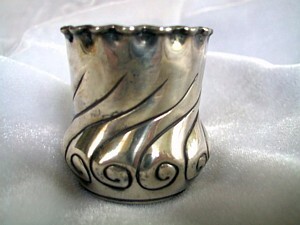 Prices on metal toothpick holders have also remained fairly reasonable, with the exception of the figurals. Figurals have become very popular and do command a higher price. As with most collectibles, the condition of the toothpick holder is of primary importance when determining value. If glass or china toothpicks are chipped or cracked, the value drops significantly and they are definitely not a good investment. With metal, you need to be aware of dents, pieces that are out-of-round, or metal that has corroded. It is not uncommon for the silver plating to have significant wear causing the toothpick to have a darkened appearance. Some collectors prefer to have them re-silvered so they are once again shiny and beautiful; other opt to leave them as they are found with the worn metal showing its age. While toothpicks are becoming more and more difficult to find, they can generally be found at antique shops, flea markets, antique shows, and public auctions - and there are tons of them available via the online auctions. A word of caution – toothpicks have been widely reproduced. You really need to know what you are buying. They only way to do this is by studying the reference books that are available, spending the time required to educate yourself by talking with dealers and experienced collectors, and gaining some actual experience. If you are not willing to devote the time required to gain expertise in this unique field, be sure you are happy with the price you are paying, regardless of the toothpick’s age and authenticity. Many of the newer toothpicks are lovely. They are available in colors that were not available during the heyday of the toothpick holder, and have become collectibles in their own right. Another source of confusion for collectors is items that closely resemble toothpick holders, but are really something else such as a shot glass, match holder, or small open sugar. There are no hard and fast rules for distinguishing among these items, but there are some general guidelines that help to identify them. Shot glasses generally taper from top to bottom, have straight sides, and a plain rim; toothpicks more often have a scalloped, serrated, or shaped rim. There is often an area on match holders that can be used for striking a match. This may be a textured area on the body of the item or ridges or rings on the base. Match strikers are not found on toothpick holders. With open sugars, the shape is often the distinguishing factor. They generally have two handles and the top is the widest part of the item. Some may have a ridge that would support a lid. Remember that these are guidelines, not hard and fast rules. There are two reference books currently available: Glass Toothpick Holders by Bredehoft and Sanford and China Toothpick Holders by Knauer and Raymond. Several other references are out-of-print but may be found through used book sellers or online auctions. They are: Toothpick Holders from A to Z, 1000 Toothpick Holders, and Rare and Unlisted Toothpick Holders all by William Heacock; Toothpicks Holders: China, Glass, and Metal by the members of the National Toothpick Holder Collectors Society. The National Toothpick Holder Collectors Society (NTHCS) was founded in 1973 and is a wonderful source of information for beginning and experienced collectors alike. The organization publishes 10 newsletters a year and sponsors a national convention annually. An exclusive toothpick holder is produced each year in conjunction with the convention and is made available to Society members. The convention is held the second weekend in August. NTHCS annual dues for the US and Canada are $20 for a single membership and $25 for two at the same address. To join or for additional membership information, contact Membership Chairman, P. O. Box 852, Archer City, TX 76351. Please visit our web site at www.NTHCS.org. Judy Knauer is the Founder of the National Toothpick Holder Collectors Society and remains an active member. She published the Toothpick Bulletin for 24 years and has chaired three national conventions in various parts of the US. Judy has written numerous articles on toothpick holders and is co-author of the reference book China Toothpick Holders. She has been a guest speaker for several antique-related organizations and has also taught classes on antique glass.